All of us who share a passion for writing read a great deal. But reading, no matter how widely, does not give us all the skills required to write and edit our work effectively. Working on our own (even with the support of friends and family) it is tough to develop our initial aspirations and ideas into an accomplished piece of work that will compete in today’s highly competitive market. It is not difficult to find people who will offer us their opinions - writers’ groups, on-line writing forums and creative writing courses can all provide excellent support and help build confidence - but they may not have the professional experience to pinpoint the strengths and weaknesses in our work, understand our writing critically and help us to write better. Few writers possess both writing skills and the skills to edit their own work in equal measure. 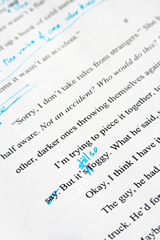 Editors can help authors gain objective understanding of how the complex inter-play of elements is working on the page and spot when and why they are not. A good literary editor should be both ruthless and constructive. They must balance the technical discipline of written language with the aesthetic and imaginative aims of the author. Their observations and suggestions should help the writer find ways of improving their work whilst remaining faithful to their artistic intentions and unique style. New writers often fall into a number of avoidable traps (see our top ten pitfalls). If the editorial feedback you receive is simply in the form of a lengthy literary critique it can feel confusing and overwhelming. A litany of negative comments, however scholarly, can be depressing and unhelpful. It is hard for an author to unpack all these observations and see the practical steps they could take to improve their work. We believe good editorial feedback should inspire and empower the writer and never make them feel defeated. We cannot offer guarantees about placing your writing with an agent or publisher but we will offer you sound editorial advice, drawing on established principles that will make you think more objectively and critically about your work and help towards achieving your goals.